Fast or superfast water transport with carbon nanotubes? (Nanowerk News) There were high hopes of using carbon nanotubes, particularly for ultra-fast water transport to desalinate seawater. However, a simulation now reveals that these ultra-fast transport rates might have not been properly grounded after all. Researchers who work with experiments and computer models have been at odds over the capabilities and governing physics of the material ever since. The use of CNT membranes as a filter medium is perhaps more realistic. 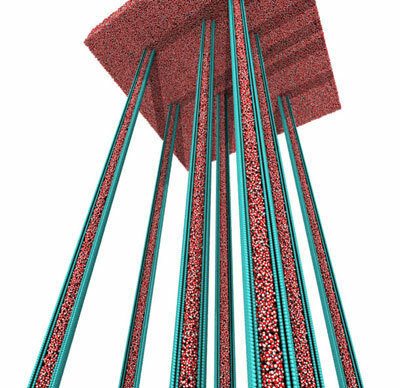 Experiments and simulations indicate that water molecules flow through such membranes extremely quickly, which makes them interesting as filters for cost-efficient seawater desalination plants: water molecules pass through the ultra-narrow pores, salt ions don’t. This potential for CNT membranes is thus being researched intensively. However, the story of CNTs is riddled with controversies. While some experimental researchers have actually observed a flow rate that was 100,000 times greater and published this in Nature ("Nanoscale hydrodynamics: Enhanced flow in carbon nanotubes"), others have measured water flows that were enhanced by only 100 to 1000 times. Nor did simulations help to answer the question as to whether CNT membranes really harbour so much potential. Previous computer models consider too few water molecules and CNTs that are too short compared to the experimentally used CNTs. Simulations that reported a 100,000-fold enhancement only arrived at this value through an extrapolation. A team of researchers headed by Professor Petros Koumoutsakos has now fuelled this scientific debate with the largest and most detailed simulation of water flow through carbon nanotubes to date. The computer model simulates CNTs of the same length as those used in experiments. A paper has just been published in the journal Nano Letters ("Barriers to Superfast Water Transport in Carbon Nanotube Membranes"). Interestingly, the simulations have been able to confirm only a 200-fold enhancement of the water flow and do not confirm the 100,000-fold enhancement that had been claimed by some experimentalists. For Petros Koumoutsakos, these reported ultra-fast rates are a mystery. “Our simulations suggest that such high flow rates are not possible for pure water and CNTs,” says the ETH-Zurich professor. Koumoutsakos was able to confirm that an increased CNT length enhances water flow albeit only up to a certain length. After 500nm the transport rates remain largely unchanged. He also succeeded in simulating and explaining theoretically hindrances to water entrance and exit of a tube that reduce the flow rate. However, this only affects short CNTs, barely having an impact on long ones. The computational scientist cannot understand why his simulation’s flow rate differs so much from the values measured in certain experiments. “Our results even coincide with results from more recent experimental tests,” stresses Koumoutsakos. He suspects that chemical modifications of the CNTs or other unobserved phenomena could enhance the flow. However, the simulation does not account for such impurities, he says. Consequently, Koumoutsakos envisions the development of computer models that also factor in and quantify such uncertainties. Hyung Gyu Park, an assistant professor of energy technology at ETH Zurich, is one of the researchers who determined the flow rates experimentally. He conducted experiments with CNTs that Koumoutsakos now partly calls into question and published the results in the journal Science back in 2006. Park observed transport rates that were 500 to 8,500 times higher than the theoretical forecasts. In the best-case scenario, the values he obtained through experiments and the simulation deviate by 2.5 times. “Therefore, they match up rather well,” he says. Park says that the computer scientist’s approach is correct in principle. However, the prerequisites the simulations are based upon differ from his experiments. For instance, he used carbon nanotubes that were between one and two nanometres in diameter. In the simulation, however, the diameter was 2.03 nanometres. While the difference might seem tiny and insignificant, on this scale water transport changes greatly, as Park observed experimentally. The simulation also only took one tube diameter into consideration; his experiments, however, took several. Despite his criticism, Park sees the simulation developed by his departmental colleague as a key contribution, from which experimental research only stands to benefit. He regards it as an advancement in modelling flow phenomena on a nanometre scale and under conditions that prevail in graphite environments. “I’ll check this model and my results carefully with nanotube membranes in the future,” he stresses. After all, he concedes, it is very difficult to gauge such transport processes on a nanometre scale experimentally. Moreover, it is a challenge to synthesise a trillion (1012) CNTs with a constant diameter for constructing a centimetre-sized membrane device, a feat Park’s research group recently accomplished. They are currently working on producing CNT membranes on a larger scale. Despite their scientific debate, both scientists see it as a rare privilege that researchers work on experiments and simulations on this subject in the same institution. “I’m convinced that our healthy competition and collaboration between scientists from both fields will stand this exciting research field in good stead,” says Park.